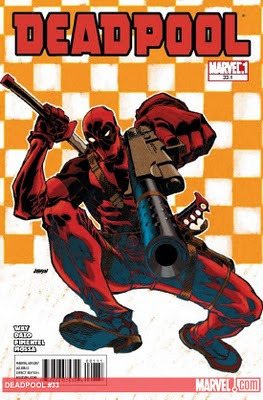 This week, Marvel is trying to lure us new readers to Deadpool, the Merc with a Mouth. For those who have been reading all of the Point One's like me, we actually got our first taste of Deadpool in Wolverine's point one issue. It's fair to say that the Wolverine issue was on target for this character. We start off with Deadpool talking to the audience. As I understand it, he breaks the fourth wall a lot. So Deadpool tells us that he is the Merc with a Mouth, has better healing abilities than wolf or badger based heroes, and multiple streams of thought. He also tells us that he is actually in space but for this Point One issue he will go back to earth. Deadpool is hired to evict The Wrecker, a villain who has a super-powered crowbar and once fought all of the Avengers to a standstill. The owners can't sell the building until he leaves. After one fight where The Wrecker beats the crap out of Deadpool, he decides to blackmail his clients out of more money to fight The Wrecker again. Deadpool starts the fight and then we learn that he isn't fighting The Wrecker anymore. He is actually working with him to stop the sale and protect the tenants. Deadpool gives the cash he got for the job to a old lady in the building so she can buy it, and then kills the two owners for her.... for soup. This was an entertaining issue. It gave a good background for the character and showed him in an everyday adventure; at least, it is for him. 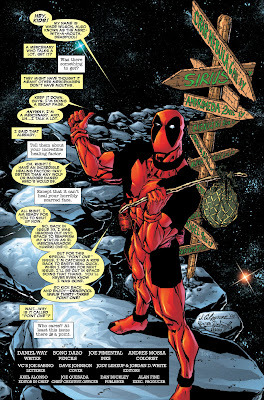 I have heard a bit about Deadpool's sarcasm, this issue really highlighted that. I'm just not sure this comic is for me though. At times, it felt like I was reading MAD magazine. I'm enjoying it now but I'm not subscribing. I certainly understand the appeal to readers and moviegoers; this character (hopefully) will be great on film. And speak this time. It did fufill the Point One requirements of providing a background for the character. It was even the first story to really refer to a current storyline. All in all, not a bad issue, just not my style. I may pick up a one-shot or a mini series on special occasions. If this type of sarcastic humor is your thing though, this is the book for you.